Set to operate at 3200 psi (shop air pressure between 80 and 120 psi maximum – air regulator included in package) this pint-sized power-house puts 17,000 pounds of expanding force in your hands. 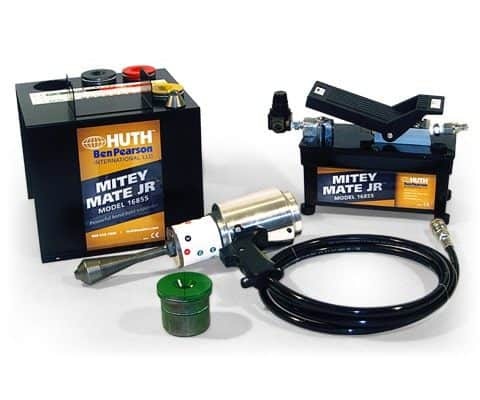 1685S Mitey Mate Jr. comes with tooling to expand 1-1/2″ to 3″” I.D. mufflers and pipes (15/16″ ID to 4″ capability with additional tooling). 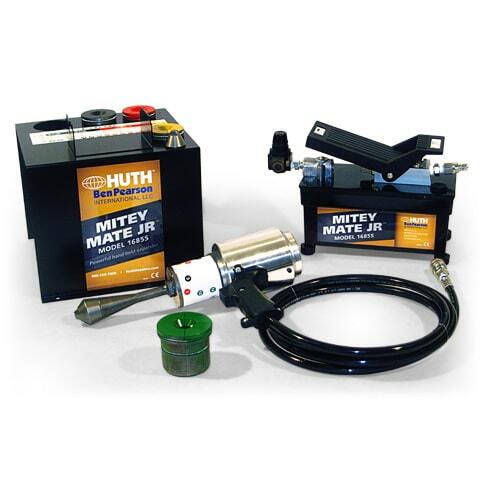 It also comes with Huth’s unique Accu-Sizer system for right-on expansions, job after job. The Accu-Sizer system and calibration decals on the H1685S have been upgraded to include metric dimensions, escpecially useful to our growing list of non-US customers. The expander itself, with its high-impact pistol grip, removable arbor tips and simple-to-setup bulls-eye sizing adjustments, weighs only 7 pounds. All three peices together weigh only 34 pounds. The handy storage unit, which holds the expander, the four sement sets and one of the two detachable arbor tips, is 9″ high by 10-1/2″ square. The power pedal is only 8″ high, 10″ long, and 5″ wide, and fits under the storage unit. 1685S includes the H476 3″ Segment, Metric Calibrations and is CE Approved.